Obi-Wan and Satine are both seemingly excellent characters. At first glance, Obi-Wan might seem slightly worse than his Legacies counterpart, but on closer inspection, I think he might be a little better. What he loses in HP and the free shield every turn, he more than makes up for with his Power Action, excellent die, and being one point cheaper opens him up to more combinations. 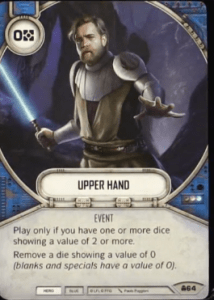 They’re definitely pushing more character subtypes with this new set, and since Obi-Wan has the Jedi subtype, he’ll be able to synergize with all the Jedi cards in the set. Satine is a beast of a budget character. For 10 points, you get both of her dice at 9 HP and the Leader subtype. Her die sides are also nothing to scoff at, at that price. A 2 Indirect, 2 Focus sides and a 2 for one resource are all solid sides. The fact that she has more than one two side is also a bonus for roll-off potential. Both of these characters I think will see a decent amount of play. Satine probably more so because of her low-cost Elite and the fact that she fills a great support slot that Maz did previously. I’m not a huge fan of this plot. 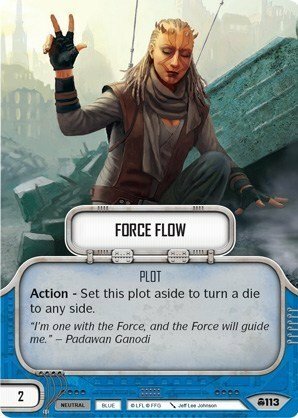 It might be fine in Trilogy play, but there are so many better options for 2 points in Standard that I don’t see it being a big factor. Double Down, Taking Ground, and Stolen Intel are all better at that cost. 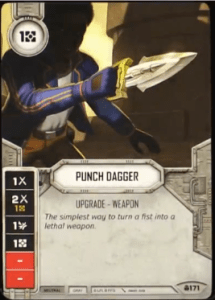 I really dig the Punch Dagger. It’s the 1-cost melee upgrade that we’ve been missing. DH-17 and (to a less extent) Hunting Rifle were solid 1-cost drops for ranged decks, but melee centric decks never really had that option. The fact that it has two base damage sides and a resource side make it an ideal round 1 play that lets you keep a resource for mitigation. The Republic Jedi Armor seems pretty solid as a replacement for the rotating out Jedi Robes. It has some decent sides to keep your shields up, and extra Focus sides are never a bad thing. At the very least, it’s an early defense that can be turned into a weapon later through an overwrite. 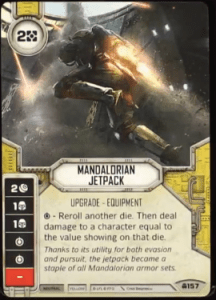 Mandalorian Jetpack is a weird card. It’s not necessarily a bad card, and with Vader around it could be outright deadly to him. I don’t know if it’s worth the two resources to play a card that might do almost nothing for you in a lot of games. The fact that it also doesn’t have a resource side hurts it I think. I’m very interested to see where this card ends up falling because I don’t hate it, but I also don’t know where I’d include it. Grievance Striker is another weird one. On the one hand, I really like the Redeploy since we are losing Holdout Blaster to rotation. On the other hand, it makes Obi-Wan really slow if you play it on him. 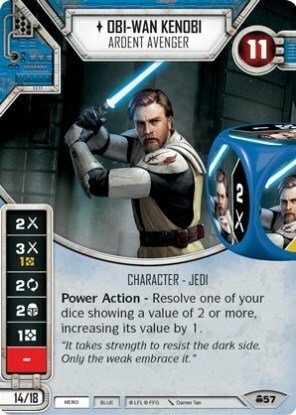 Three base damage sides are solid, but it doesn’t synergize at all with Obi-Wan except to get that free damage for playing it. 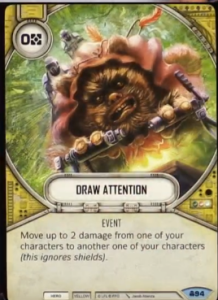 The only reason I could see this make its way into an Ob-Wan deck is if you really want to land his Power Action for 3 Indirect. Which doesn’t feel terrible, but it also doesn’t feel great. I get the thematic reason for it, but it feels slightly weird. Channel the Force is both a better and worse version of Beguile. 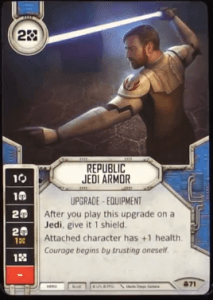 It’s solid enough in the starter and in a deck that has both a Jedi and a Leader. 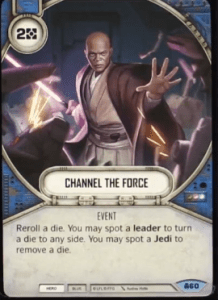 The fact that you can alter your own dice with it is pretty cool too, but this seems like it will really shine in a Mace deck since he has both Jedi and Leader subtypes. 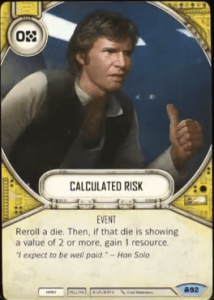 Calculated Risk is a cool card for several upcoming characters. Obi-Wan gives you a 2/3 chance to get that resource. With 2+ shields, Qui-Gon Jin: Defiant Jedi Master absolutely loves this card. It’s basically free money as long as you don’t hit that dreaded blank side. 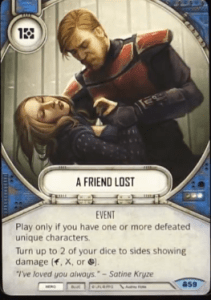 A Friend Lost is an interesting card. It requires you to be on your back foot for it to be the most useful. The problem is that I’d say most of the time, your opponent is going to be gunning for your bigger character, so this card feels way less effective when you’d want to use it. Not only that, but it requires at least a small amount of hand knowledge so that you can play around mitigation. Upper Hand seems like it will find a decent place in a few decks. I can see it being a staple in Obi-Wan and Qui-Gon decks. Mace also has a pretty good die that is capable of meeting its play restriction. With so many specials out there, this seems like a solid 0-cost removal for Blue Hero. I do wonder if it falls into similar pits that Blue Hero falls in that it requires you to have dice out in order to really use mitigation. Unshackle is another weird one. I don’t know if it will find a place in most decks except for maybe Vader and Palpatine. Most of the downgrades that we’ve seen aren’t super devastating except for Target Acquired. Mind Extraction is the other big target for Unshackle, but even that isn’t that terrifying except on Palpatine. Electromagnetic Pulse is great. 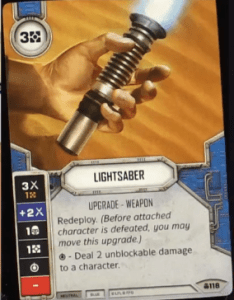 0-cost gray removal that gets rid of a vehicle or droid die seems fantastic. 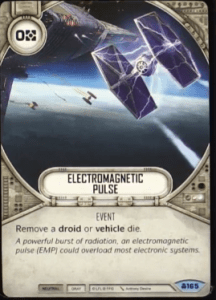 With the rise of Shadowcaster/Firespray decks and (I assume) the rise of more droid decks, this card seems like a great include. 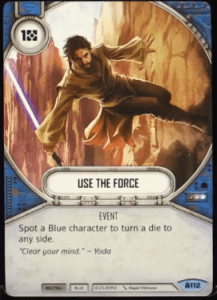 Of course, it’s definitely a meta call because if no one around you is playing droids or vehicles, and they don’t take off for some reason, this card obviously won’t see play. I suspect we’ll see plenty of both of those decks though. It’s also important to note that there was one card in hand that we were unable to make out. It was a 1-cost Blue event, but we don’t know much beyond that. 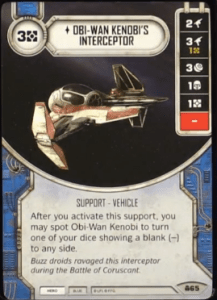 Obi-Wan’s Interceptor seems pretty solid in his deck, not so much in others. The ability to spot him to fix a blank is pretty solid, and the sides work well with his Power Action. 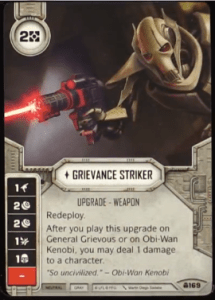 This seems like it might be in a similar spot as the Grievance Striker in here though since it slows you down with all the different damage sides. Still, 3-cost for potentially four damage a turn is pretty nice. Seeking the Truth doesn’t seem awful, but it doesn’t seem great either. 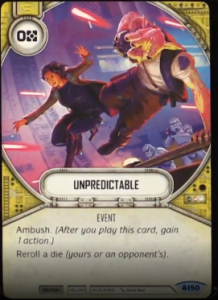 We’ve all been on the bad end of using a card to effect to re-roll an opponent’s die, and it ends up on the same side, or a better one for them. 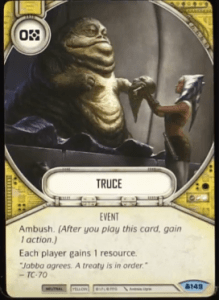 A leader-heavy deck could make decent use of this since it could give you two potential re-rolls if your first doesn’t go the way you want. I believe we’ll see a decent amount of this battlefield because I think we’ll see a decent amount of Satine. The battlefield synergizes very well with her to give some much needed anti-mill tech. One of the characters I was most excited for this set was definitely DJ – Treacherous Rogue. Just looking at him, he hit all the points I wanted from a character. At 16 points, he has decent pairings with all three colors. He has 2 base damage sides at 2 damage each. Most importantly, he turns all your removal events into damage out of hand cards. Here’s a few decks I’ve been working on with DJ. This is the first DJ deck I built when I got him. In my desire to make Aphra even better, I paired her with the treacherous flip-flopper. The result is a lethal combo of droids and removal. 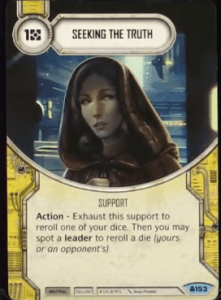 Aphra’s ability is excellent this set with the addition of 0-0-0 to the mix. 0-0-0 and BT-1 combine for massive damage without even caring what the roll out is on either of them. Personally, I think 0-0-0 is the best non-vehicle support in the set. For the low-cost of 2 resources, you get a die with 3 base damage sides and no blanks. Streetwise is also an extremely good card in mono-Yellow. The economy it generates is excellent and it allows for cards like In the Crosshairs to be very affordable. The biggest weaknesses of this deck are pretty obvious. Kylo2 really hurts it since it is one color. Also, not getting the 0-0-0/BT-1 combo active early is also pretty rough since it generates a ton of damage for you. Out of the three decks listed in this article, this is probably the most consistent one. Snoke is incredibly consistent with his focus sides and his ability turns DJ’s dice into something to be feared. Resolving 4 damage into an opponent with 1 die is incredibly good, especially right now considering the large amount of 3 and 4-wide decks out there. The force powers package is added lethality since things like Force Throw and Psychometry remove a die so they can also trigger DJ’s ability. Added to these things is the fact that Blue/Yellow Villain gets you the best removal suite in the game. The biggest weakness of this deck is really not finding Holocron early. Without it, you can’t get good upgrades on DJ and your economy suffers from having to hard-play upgrades on Snoke. This deck is inspired by the old-school Jango/2xFOST list from Awakenings. This one brings back the 0-0-0/BT-1 combo and since you get 3 characters to dump damage off on to, I also added in the Climate DIsruption Array. With that out plus 0-0-0, you get to deal 3 damage at the cost of 2 to yourself every turn. That plus BT-1 means you are dealing 5 damage every turn to your opponent without having to roll in any dice. It’s a nasty combo that can quickly overwhelm your opponent if it hits the board early. Having Red in the mix also grants you extra multi-die removal with things like The Best Defense and Crossfire. The biggest weakness to this deck is the Stormtroopers since they have low health and their die is decent, but 2 blank sides can definitely hurt. This version also runs pretty low on upgrades so that can be harmful in many matchups. With the Legacies meta coming to a close, I thought it was time to reflect on some decks that made the game fun during the time period. I’m not talking about the top tier decks that everyone knows. I’m talking about the fringe decks that hang around and toe the line between getting beat down by the top tier and coming out and dominating a tournament. 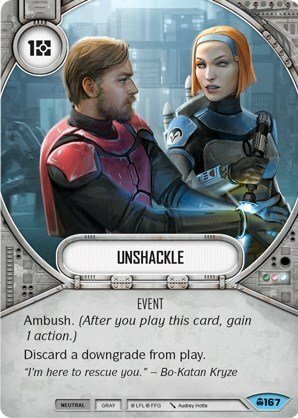 Let’s show some love for the Tier 1.5 and Tier 2 decks for Legacies. Figured I would get this party started with my personal favorite fringe deck of the Legacies meta. If you’ve read some of my other articles, you’ve seen how much I gush about Kanan. I think his versatility is incredible and his ability just makes him downright dangerous. Combine Kanan’s ability with Zeb’s and you have a recipe for destruction. Zeb’s ability allows him to synergize with Kanan as well as being able to add cards in the deck that both characters can utilize like Jetpack. Being able to drop Second Chance on Zeb is really nice as well. The biggest weakness this deck faces are generally from within. When existing within the realm of Hero cards, removal can be difficult sometimes. Two of the best Blue removal cards, Guard and Force Misdirection, don’t work at all with Zeb’s character dice. 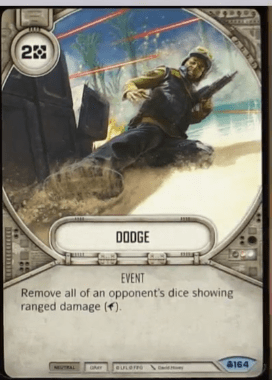 Force Misdirection works well with Kanan’s diverse die, but Guard is usually lacking with him since he only has one Melee side. Another issue is the paid side for Zeb’s big damage. This doesn’t tend to be a huge issue in the mid to late game since Maz’s Vault helps out a lot in those stages of the game. This is a very interesting deck and one I struggled to put on here. This combination saw a ton of play early on in the Legacies meta and won a good deal, but seemed to really fall off the map as the meta progressed. Tarkin’s Power Action is just brutal and really makes your opponent be scared of blanks. This combos well with cards like Anger so that you can get the most out of the dice at your disposal. 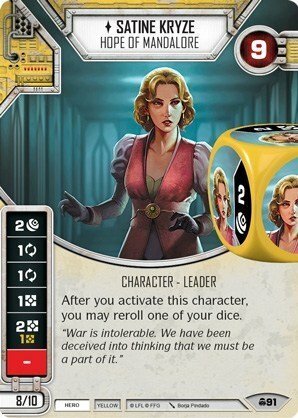 Seventh Sister is probably the best 14 point character in the game since she gives you 3 dice for that cost. The biggest weakness of this deck is really any deck that can deny you resources since Tarkin decks really require you to have dice out on the table to utilize his Power Action well. Anything with Hondo is usually solid against Tarkin since he can deny your upgrades from hitting the table. Who doesn’t love Battle Droids? These pesky guys can gang-up on you very quickly with their ability to activate quickly and push out a ton of damage. The really nasty variation of this deck includes the LR1K Sonic Cannon and Imperial Backing. These two cards combo for some massive damage if you get them out early. Being able to field five characters is always intimidating, especially if you include a few Redeploy weapons that continue to bounce around. The big weakness for this deck is definitely Sabine. 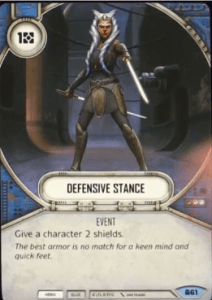 Against her, you’d usually down two Droids by the time turn 2 is in progress and needless to say, the effectiveness of the Droid declines rapidly when you start losing them. 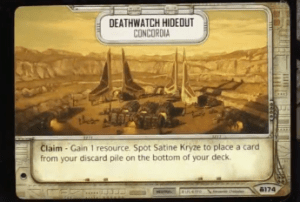 This deck has a few variations that include both Endless Ranks and Separatist Landing Craft that I have seen. At the end of the day, this deck is super fun to play, if a bit squishy and inconsistent. This is a deck that is way more fun than it has any right to be. This is almost a fun call-back to the old Vader/Raider deck with a few notable exceptions. The biggest difference between this deck and Vader/Raider is Nute’s die. While is die is very weak in this deck, he makes up for it with a really brutal ability against certain decks. Losing two cards or a resource every turn is a massive nuisance. You also get a huge boost by being able to play Leadership on him to give Vader a second activation. You can also combo that with The Price of Failure if you have a particularly good opportunity and give Vader a third activation in one turn what can be really brutal. The biggest weakness for this deck is really a lack of removal combined with a very weak Nute die. Vader/Raider could survive long enough and push through extra damage with the Raider’s die at the end of a game. Nute can’t really do that unfortunately. While this deck is pretty fun, it lacks the explosiveness and options to be really threatening at the top of the meta. In my never-ending quest to find wacky combos with characters, I somehow ended up here. I had a lot of fun with this deck. Hero Red has some great defensive cards like Field Medic and Honor Guard. The added bonus of having Leadership available can really be big when wanting to push through damage. Electrostaff is also a great include in Obi-Wan decks since it takes some pressure off that paid side that he has. The main problem with this deck is that it is way more inconsistent than it’s more productive counterpart in Obi2/Maz. Resource generation here is slower and damage is far less consistent since you don’t get the Maz ability. While this deck can be extremely defensive, it has trouble pushing out enough consistent damage to really be a threat against the more popular decks out there.